Contrived Randomness – choosing by lots does not seem to be a control method, but in fact it is a part of a method that is used every day in almost every business. Contrived randomness is usually used along with another of the control techniques. Instead of constantly applying the other control processes, they are applied in a random fashion. It is easy to imagine how the contrived randomness is vital to cost effective and just plain effective controlling. If Oversight, for example, is used for controlling on a constant basis, it is very costly, requiring review of every single outcome. However, if the Oversight is applied regularly, say every 10th event, then the cost is reduced by 90%, but the effectiveness is also reduced by up to 90%. That is because the person who is being overseen can easily adjust to comply with the control process only on every 10th event and fail to comply the other 9 times without the control process noticing. Using a random schedule means that a person seeking to avoid the effort of compliance is at much higher risk of being caught by oversight. And even better, BF Skinner found that intermittent reinforcement provided by positive situations found in random inspections can have much higher impact on creating favorable habits than regular or even constant reinforcement. The chart also suggest rotation of staff. This part of the Contrived Randomness approach to controlling is seen in the efforts by banks to control fraud by shifting employees and especially by doing more thorough audits during employee vacations, which is again a combination of randomness and Oversight. Mutuality – When Mutuality is used as a control system, it sometimes uses peer review, in addition to processes that involve partnering. The partnering process can be very expensive, or it may save time and money depending on the process. When the partnering involves two people doing what one might have done, then the extra cost is obvious. In fact, the cost might well be more than double for a two person term because of the degree in interaction between the partners that might add time to the tasks. This must be offset by an increase in effectiveness, quality or continuity for the doubling of resources to make sense. But the control system application of peer review is very common. The peer review can be at several possible levels – the peer can be doing a very high level check – “does this make sense?” Or they can be doing a more thorough review. Or the peer can be trying to totally independently reproduce the work being reviewed. In addition, the decision must be made of the frequency of the peer review. The same ideas expressed above about intermittent reinforcement apply to peer review. Oversight – monitoring from a supervisory position is the most common form of control. The supervisor is the most natural candidate for the type of oversight that is needed. It means broadening the supervisor’s role to go beyond the accomplishment of the primary objective of the unit to also include the controlling objectives. The downside to this method is the dilution of the supervisor’s attention distracting them from the accomplishment of the primary objective. In addition, there is the potential mismatch of skills and talents. In some cases, the primary objective and the controlling objectives require very different methods and skills. Competition – Competition is another technique that may be difficult to imagine as a control method. And what is needed to make competition a controlling system is openness of information about the activities that are to be controlled. For different members of a team to compete, they need to know what and how the others are doing. This openness is not very common. But one of the objectives of the open office movement is the free controlling that automatically comes in the open environment. Some firms do use Competition through a totally open system of managing where all members of a unit know about what every other member is doing. Control breaches then can only happen if the entire unit agrees that they are necessary. Many would think that Oversight is the main form of controlling. Hopefully, this post will expand your view to include these other options. At BusinessInsider.com, a feature from Guillermo Felices tells of 8 shocks that are about to slam the global economy. How should ideas like these impact on ERM systems? Is it at all reasonable to say that they should not? Definitely not. In the calibration of the risk model. Model assumptions can be adjusted to reflect the potential near term impact of the shocks. Some of the shocks are certain and could be thought to impact on expected economic activity (Japanese disaster) but have a range of possible consequences (changing volatility). Other shocks, which are much less certain (end of QE2 – because there could still be a QE3) may be difficult to work into model assumptions. With Stress and Scenario Tests – each of these shocks as well as combinations of the shocks could be stress or scenario tests. Riskviews suggest that developing a handful of fully developed scenarios with 3 or more of these shocks in each would be the modst useful. In the choices of Risk Appetite. The information and stress.scenario tests should lead to a serious reexamination of risk appetite. There are several reasonable reactions – to simply reduce risk appetite in total, to selectively reduce risk appetite, to increase efforts to diversify risks, or to plan to aggressively take on more risk as some risks are found to have much higher reward. The last strategy mentioned above (aggressively take on more risk) might not be thought of by most to be a risk management strategy. But think of it this way, the strategy could be stated as an increase in the minimum target reward for risk. Since things are expected to be riskier, the firm decides that it must get paid more for risk taking, staying away from lower paid risks. This actually makes quite a bit MORE sense than taking the same risks, expecting the same reward for risks and just taking less risk, which might be the most common strategy selected. The final consideration is compensation. How should the firm be paying people for their performance in a riskier environment? How should the increase in market risk premium be treated? See Risk adjusted performance measures for starters. More discussion on a future post. “The unprecedented scale of the earthquake and tsunami that struck Japan, frankly speaking, were among many things that happened that had not been anticipated under our disaster management contingency plans.” Japanese Chief Cabinet Secretary Yukio Edano. In the past 30 days, there have been 10 earthquakes of magnitude 6 or higher. In the past 100 years, there have been over 80 earthquakes magnitude 8.0 or greater. 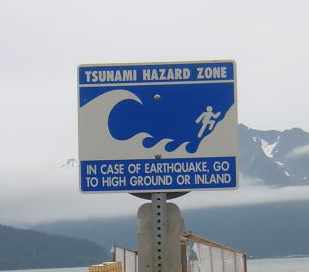 The Japanese are reputed to be the most prepared for earthquakes. And also to experience the most earthquakes of any settled region on the globe. By some counts, Japan experiences 10% of all earthquakes that are on land and 20% of all severe earthquakes. But where should they, or anyone making risk management decisions, draw the line in preparation? In other words, what amount of safety are you willing to pay for in advance and what magnitude of loss event are you willing to say that you will have to live with the consequences. That amount is your risk tolerance. You will do what you need to do to manage the risk – but only up to a certain point. That is because too much security is too expensive, too disruptive. You are willing to tolerate the larger loss events because you believe them to be sufficiently rare. In New Zealand, that cost/risk trade off thinking allowed them to set a standard for retrofitting of existing structures of 1/3 of the standard for new buildings. But, they also allowed 20 years transition. Not as much of an issue now. Many of the older buildings, at least in Christchurch are gone. But experience changes our view of frequency. We actually change the loss distribution curve in our minds that is used for decision making. Risk managers need to be aware of these shifts. We need to recognize them. We want to say that these shifts represent shifts in risk appetite. But we need to also realize that they represent changes in risk perception. When our models do not move as risk perception moves, the models lose fundamental credibility. In addition, when modelers do things like what some of the cat modeling firms are doing right now, that is moving the model frequency when people’s risk perceptions are not moving at all, they also lose credibility for that. So perhaps you want scientists and mathematicians creating the basic models, but someone who is familiar with the psychology of risk needs to learn an effective way to integrate those changes in risk perceptions (or lack thereof) with changes in models (or lack thereof). The idea of moving risk appetite and tolerance up and down as management gets more or less comfortable with the model estimations of risk might work. But you are still then left with the issue of model credibility. What is really needed is a way to combine the science/math with the psychology. Market consistent models come the closest to accomplishing that. The pure math/science folks see the herding aspect of market psychology as a miscalibration of the model. But they are just misunderstanding what is being done. What is needed is an ability to create adjustments to risk calculations that are applied to non-traded risks that allow for the combination of science & math analysis of the risk with the emotional component. Then the models will accurately reflect how and where management wants to draw the line. “There is currently an upsurge in management’s willingness to listen to risk managers.” But Risk Managers consistently show a disturbing tendency towards projecting the next crisis from the last. Now in its fourth year, the Emerging Risks Survey from the Joint Risk Management Section and conducted by Max Rudolph. Emerging risks are risks that are evolving in uncertain ways, have been forgotten in their dormancy, or are new. Emerging risks typically do not have a known distribution, that is their frequency is unknown. In 2007, a shock to oil prices was seen as the top “emerging risk” in the first survey of risk managers. That year had seen a major spike in oil prices. In 2008, a blow-up in asset prices was identified as the top “emerging risk” immediately following the melt down of the sub prime market and a major drop in stock prices. In 2009, a fall in the value of the US dollar was identified as the top “emerging risk” at the end of a year when many major currencies had strengthened against the dollar. The new 2010 survey, released this week, indicates again that a fall in the US dollar is the top “emerging risk”. If in fact these risk managers are advising their employers in the same way that they answer surveys, firms will continue to be well prepared for the last crisis and unprepared for the next one. However, when asked to identify the single top emerging risk concern, a Chinese economic hard landing was the top pick with 14% of the respondents selecting that choice. That is certainly a scenario that has not just recently happened. So at least 14% of the respondents are doing some forward thinking.